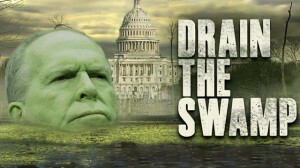 RUSH: When did John Brennan become some sacrosanct? You guys…? 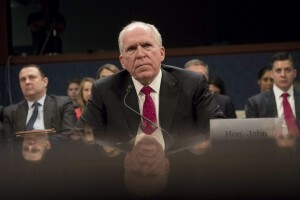 Do you realize that this clown, Brennan, voted for the Communist Party candidate for president once, that he was a big muckety-muck in the CIA during 9/11 (which they had no idea was coming), and he was also part of the intel group that was telling everybody the Iraqis had weapons of mass destruction in the first Bush term? Now, where is it written that this guy’s infallible? Where is it written that John Brennan — above all else — must be granted his security clearance, when this guy is actively engaged in overthrowing a duly-constituted and elected president? All these people from the Obama Department of Justice should have had their security clearances pulled the moment was learned that they were involved in the dossier! From the moment it was learned they were involved with the dossier and the Clinton campaign in trying to run an intel operation to sabotage a presidential campaign, they should have been gone. They should have had their security clearances stripped way back then. But note that Obama didn’t fire ’em, either. Obama didn’t want to get rid of ’em. Now, this was all in service to Hillary Clinton. It was all in service to making sure Hillary Clinton never got charged with any of the crimes that she had committed because their futures all depended on Hillary Clinton being elected. Trump would do better to declassify the info Congress is demanding. John Brennan is one of the fiercest partisans ever to serve as CIA director. He is also one of the chief architects of the narrative that Russia was interfering in the 2016 election to ensure that Donald Trump was elected President, and since leaving office he has tweeted attacks that match Mr. Trump’s for intemperance. On Wednesday the President returned the favor when the White House announced that Mr. Brennan’s security clearance was being revoked. We’re all for challenging Mr. Brennan’s partisan motives and for investigating his behavior in office in promoting the Christopher Steele dossier that passed along uncorroborated smears about Donald Trump and Russia. He’s also been a leading critic of the House Intelligence Committee investigation into the events of 2016, perhaps because he doesn’t want his own actions exposed to public scrutiny. But the more effective and politically healthy way to fight back would be for Mr. Trump to declassify all the documents under subpoena from Congress about the 2016 election. This includes information that would let the American people know whether our top law enforcement and intelligence agencies were abusing their power as part of an effort to tip the scales in the presidential contest. Absent the full story that would provide the missing context, the revocation of Mr. Brennan’s security clearance looks petty without accomplishing anything useful. Where should the line be drawn on security clearances?